Greetings from Sabine Creek Ranch! 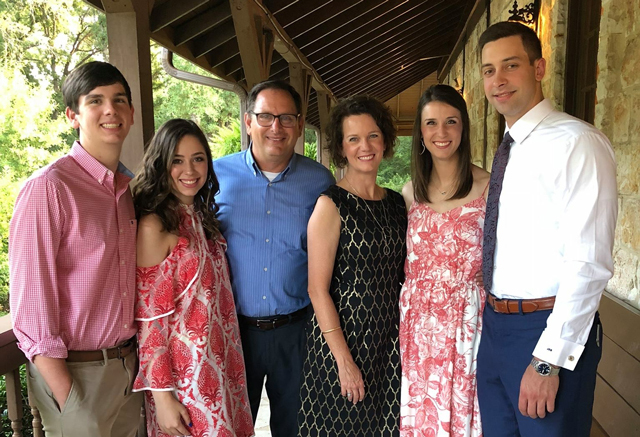 My name is Ed Walker, and my wife Sarah and I, along with our children, Cate, Caroline and Cole, enjoy welcoming groups to this special place throughout the year. We believe there is something significant that happens when we get away from our busy lives for a time to reflect and be renewed. At Sabine Creek, we’ve committed ourselves to serving others and providing a great place for our guests to grow in every area of their lives. To that end, we provide delicious food, clean facilities, exciting recreation options, and best of all, a quiet and beautiful location where the sunrises and sunsets are just incredible! And all this just 30 minutes east of downtown Dallas! Along with a special location, we have a wonderful team dedicated to making your stay here memorable. Whether you are going all out at camp, relaxing at a retreat, or celebrating a special event, our desire is to provide you with service and programs that are second to none. Sabine Creek Ranch isn’t just our home. It’s a place we’ve dedicated to the Lord to encourage people in every area of their lives. We hope that while you’re here you’ll build lasting memories, strong friendships and a growing faith. Camp has had a major impact on my life. I went to my first “away camp” at about 6 years old. I began my walk with Christ at a church camp in Jr. High, and met my lifelong friends at camp in high school. By college, I not only worked on summer staff – lifeguarding, serving meals, cleaning cabins, and every other odd job required – but also began leading music and speaking for groups of kids. That continued for 15 years as I completed business school and seminary, married my awesome wife, Sarah, and we started our family. So I didn’t have to travel 300 days a year, I also began my journey as an entrepreneur. I’m a lifelong musician, songwriter, and arranger/orchestrator, so I wanted to have a nice sound system when traveling to locations without one (like most of the camps I’d visited). Because this was expensive, I bought the equipment and rented it out when not using it. I also started a small recording studio and began producing projects both for others, and for myself. This eventually expanded into other areas such as live event production, video production, media consultation and installation and publishing of the materials we produced. During these years Sarah and I were also investing in real estate, buying, fixing up and renting or flipping properties. In 2014, after 30 years of professional involvement in camping, I was approached by Dallas Baptist University about sharing some of what I’d learned with their students. As a result of those initial conversations, I now direct the Camp/Sport Leadership Degree program and the Center for Mentoring at the university. I love getting to not only interact with awesome students and the next generation of servant leaders, but to be a resource to camps from across the nation and even around the world. Whether it’s been through music, camping, ministry or business endeavors, Sarah and I are very blessed to have been impacted by amazing leaders, mentors, and friends and are grateful for the opportunity to share those blessings with others. Check out this history video from our 5th anniversary in 2008. The hard work, and great impact, have continued!